Healthy Red Velvet Donuts with no artificial dyes! I have been wanting to try making red velvet donuts for a long time. So yesterday I took the plunge and they came out great. Most red velvet cakes, muffins, and cookies are made with artificial food dyes. Artificial dyes are a deal breaker for me. Did you know that a traditional red velvet baked good does’t even call for food coloring? It really is all about using the cocoa powder and the vinegar together. Maybe it was all about my handy prep cooks I had helping me. 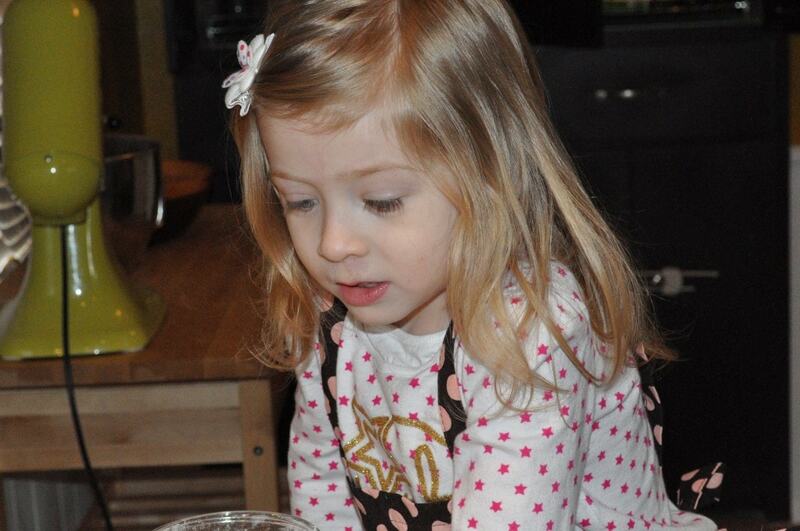 I bought Meadow and I matching aprons and she is too stinking cute wearing hers. Even Olive wanted to help out. Well, kind of. 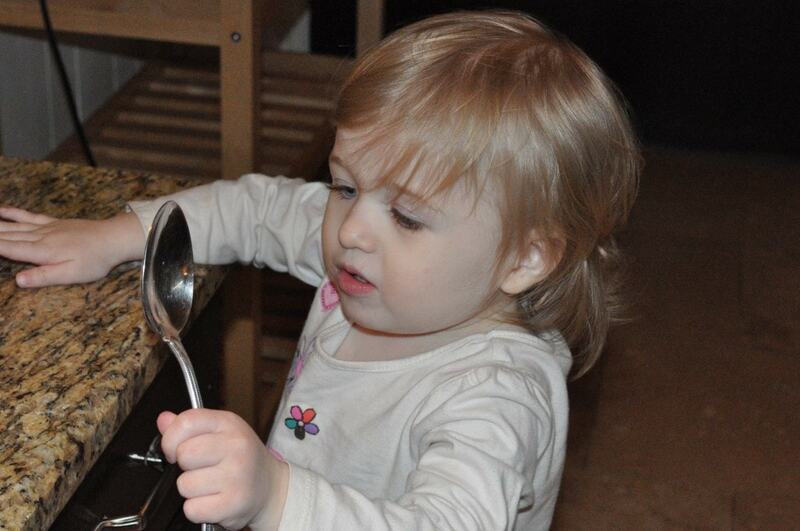 She was really just fascinated with the spoon. It’s funny, you buy your kids all these toys, but really, they want to play with stuff you have lying around your house. Every parent knows exactly what I am talking about. Give kids a cardboard box and they will play for hours! Mix all the wet ingredients in one bowl. Spoon batter into greased donut pans and bake for about 10 minutes. I got about 7 donuts out of my batch so you may want to double it for more. Not a red velvet lover? Try my Banana Chocolate Chip Donuts. It is sugar made from the sap of a coconut palm. It is mostly processed in nature. You can find it in most health food stores. It has a milder sweetness kind of like turbinado sugar. It is also low on the glycemic index meaning it won't spike your blood sugar up fast. In your ingredient list there are a couple of items that after you put in parentheses (I used ...). What do you mean? Thank you. I have been wondering what a flax egg is! Thanks for clearing that up! Love all your recipes! Going to make these now. ExceptI need to sub the spelt flour. Don't have any, but will try soon. Whole wheat flour going to be ok, you think? You can try it, but it may come out a bit denser and have a bit of a bitter taste. If you have whole wheat pastry flour, that will work great. I got my donut pans at Bed Bath and Beyond. I think they cost around $7 each. It looks like a muffin pan with donut shapes. I had read a recipe a while ago that uses beet juice for the red coloring. What could you substitute beet juice for in this recipe and/or could it be added here in some amount (?) and not ruin the mixture? You can try to add a small amount of beet juice. I am guessing a little goes a long way. I am not sure how it would work though. If you try it, I would love to know the results. Cherry juice might work too. I love that this is a healthy version! Can this be made with regular flour and a muffin pan? I bought beet powder yesterday. Have never used it before. The shop keeper said some people use it for red velvet cake, so apparently could work & perhaps add a bit of extra nutrition. I don't use food coloring, but thought this might be fun to experiment with. I would love to know if it works in this recipe. Please report the results. I have not used it. I tsp soda, as in baking soda? you have such adorable helpers. :) these donuts look fantastic! i love a healthy donut! The banana in the background is misleading. I thought this was a banana recipe! No, sorry it's just a prop. You can probably sub the yogurt for banana if you want. Melissa, Curious about the cocoa powder? What brand do you use? Do you know if all cocoa powder is dairy free? Thanks! 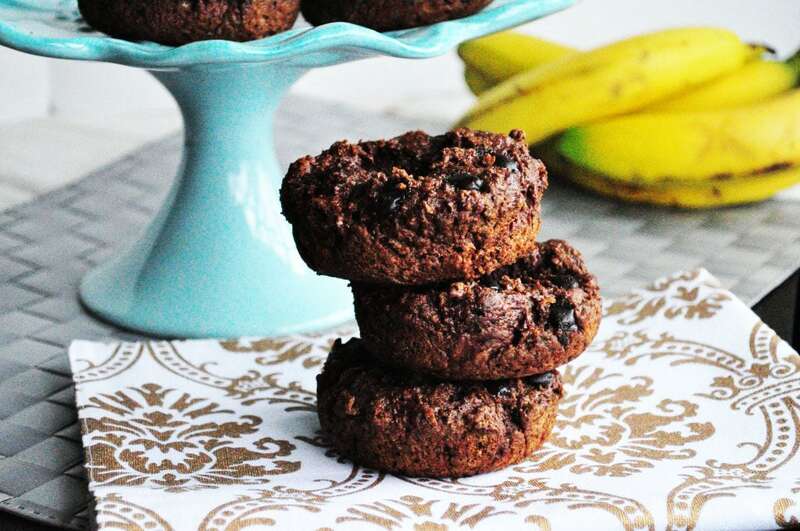 I was going to try these as muffins/cupcakes with some healthy frosting (if it exists). Do you have a good frosting substitute? Not sure of a good store bought substitute. Honestly, making your own is the best bet. Even if you use white sugar, at least it will be chemical free. www.chocolatecoveredkatie.com has some decent frosting recipes. I think most of hers are made from coconut. Not that it matters, but are they red? It is hard to tell from the picture. I would love to see a picture of a cross section of these. BTW, I have been obsessed with your blog since I found it 2 days ago. I was curious if I were to substitute coconut sugar or the like for sugar in a recipe, is it an even swap? I have read your article on sweeteners, but was confused where you stood on coconut sugar and what exactly is your favorite sugar "substitute". Thanks! Mine are not as red as the ones you see in the store because they do not contain artificial dyes. Before artificial dyes, red velvet cakes were made just as I wrote my recipe. If you are going for a more red color, you can add some beet juice. I like to use coconut sugar and maple syrup the best. Coconut sugar is an even swap. Can greek yogurt be used in this recipe?